This is my portable looping station, put together for a busking trip to Paris. 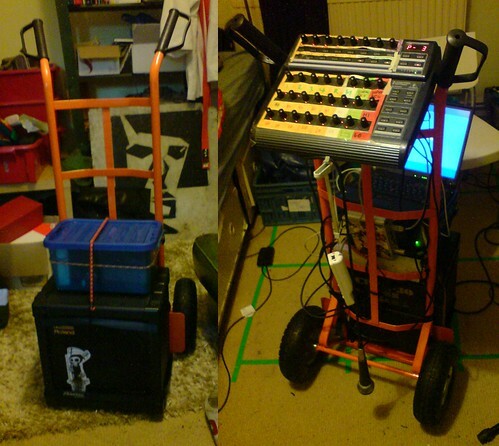 Everything packs up nice onto the trolley (speaker/power) and a rucksack (laptop and controller). It’s pretty heavy and will be difficult up and down stairs, but the plus side is that it will last for about 4 hours and it’s nice and loud with a good bass response. ← Previous Previous post: rainy days – new live track! I can see now how unfortunate it was you didn’t bring your station at the party saturday night. I wish I’d met you before your last evening in Paris.